I could pinched myself hard for not paying attention to the baking of this crème caramel custard. The recipe said one hour of baking time but I should have check the progress instead of depending on the oven timer….haizz the crème caramel turned out to be slightly burnt . Those on the inner side of the oven got slightly burnt on top thus making the texture not silky smooth as it was supposed to be. Over all it was okay. I should have known that every oven has its own characteristic and should have paid more attention to the progress of the baking then it would not have got burnt on the top . Haha …lesson learned. 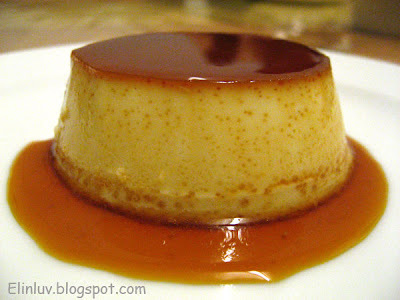 This is a nice crème caramel custard. The sweetness is just nice for my family. 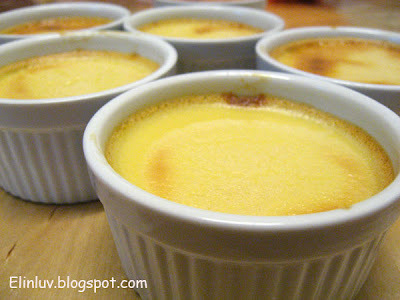 This recipe can make about 6 ramekins of size 3" diameter. Make a good after-dinner dessert . stirring until it is a light brown syrup. Pour syrup into the buttered ramekins. Place ramekins in shallow baking pan for easy handling. and the second half of sugar till lemon –colored. Gradually beat in milk and vanilla extract. Bake 1 hr until knife inserted in center comes out clean. Cool in wire racks, refrigerate , with a knife,loosen custard from ramekins and invert onto dessert dishes, letting syrup down side onto dish. Serve chilled.